On my second front for my KTM 1190 with 19" front. A step up from the Trail 2 tires for dirt roads and gravel, with no apparent loss on the street. I ride pretty hard, and get about 4500 miles on the rear, and 5500 on the front. Pretty typical for me. Great dry and wet weather grip. And good for the occasional dirt road. Happy with the performance of the front and rear TKC70's. Better in every way than the OEM Dunlops (that wore out in 3600 easy miles). These tires are fantastic and they balanced really easy. I installed these tires on a 2017 Honda CRF1000L Africa Twin. Note: They were very hard to mount but I managed with 3 Motion Pro spoons. So far, so good! Only a few hundred miles on it yet; I can’t rate it thorough enough. I was going from a conti TA2 to the TKC70 front-rear pair for more trail traction without giving up road capability. It was a bit squirrelly on the pavement while I was breaking it in, but that seems to have gone away. I had a brief ride on gravel/sand mix recently. It’s a big change from the TA2’s. I’m happy at this point in my purchase. Amazing grip on the curves and dirt trails, never failed thru the bumps and rocks of that trail. I do a lot of road driving, pavement and gravel. Find this tire to be good for my needs. Will see how many miles I get from them. Got these tires on just before the snow started to fly; luckily we have had a warm February to get some riding in. So far so good. Tires seem to grip well on wet sandy streets and overall feel is like the stock Metzlers. Rear balanced well but the front needed some extra weights to balance out. Have not gotten them off pavement yet since it's still winter but I think they will be just fine for mild off road. Only concern going in was possible road noise which isn't an really an issue; front whines a bit but nothing you notice through a helmet and wind noise. Can't speak to tread life yet or wear with only about 250 miles on them.. I've tried a number of different dual sport tires on a couple of different KLR's and this is by far the best one I've used. Works great on gravel roads as well as the interstate. Tread life has been very good so far - 3500 miles on the set and it looks like I'll get at least 5k out of the rear, more on the front. That's more than I've gotten on most other brands. I have had Michelin Ankee, Avon Trail Rider, and now 2 sets of the TKC 70 by Conti. I love Michelin tires but their Ankee 2 is not worthy of the brand nor your bike if you ride serious! The Avon's are excellent on the road on okay on trails but the rear compound wore out fast as of this writing date 11-1-16. Avon is working on a new compound for the rear which I will review next year. 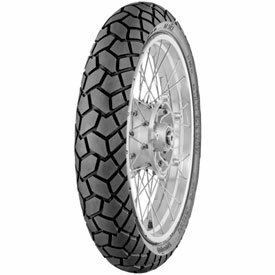 The TKC 70 are nearly the perfect tire for 70 / 30 street to trail aggressive bikers. Excellent Grip in the twisties - right to the edge. Excellent on trails, adequate in the dirt and minimal sand. The way I ride getting 5k out of a set is pretty great. It's a great tire that seems to be wearing great and handles great. I don't ride a hole lot in the rain here in Az but have a couple of times and did well. Great tire worth the money. 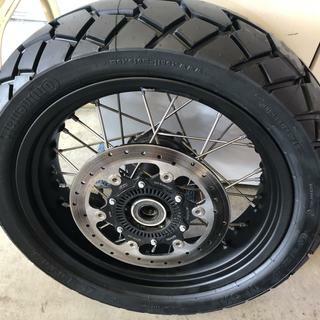 Will the continental tk c 70 front and rear tires fit stock width rims. Mainly rear tire ? BEST ANSWER: It should if it’s size matches the stock size on your bike tires. I use them on my Ktm 1190 with stock rims and they work great. If you are asking about the Suzuki DR 650 then yes they fit the stock rims. Yes, as long as they match the stock tire sizes.